If you live north of that intangible line where the winter months change from chilly to extremely cold you know what ice buildup on roofs is all about. Ice dams are formed when accumulating snow on the roof is melted from heat loss through the roof and solar heat warming the roofing material. 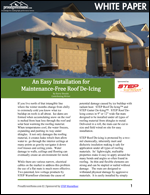 This white paper, sponsored by STEP Warmfloor, looks at one solution that uses radiant heat to eliminate the potential of damage caused by ice buildup.